This past Thursday was Mother Teresa’s 100th birthday. In 1995, we were honored to have her visit us in Massachusetts. So many people here got to meet her personally. Those encounters were a special encouragement to all of us to be better Catholics and to be better witnesses of the Gospel and servants of the poor. I understand there was a controversy a few weeks ago over lighting the Empire State Building blue and white in her honor. The greatest honor we could give her is to try and recognize Christ in the distressing disguise of the suffering and the poor in the way that she did. We will be having a special Mass at Blessed Mother Teresa Parish in Dorchester on September 4 at 10:00a.m. We look forward to seeing you there. 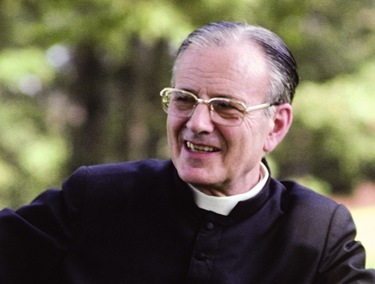 Last week we announced in The Pilot the beginning of the cause of canonization of Father Joseph Muzquiz, a Spanish priest from Opus Dei, who was among the first ordained to the priesthood in 1944 as a result of the work of St. Josemaria Escriva . You can read the decree here. 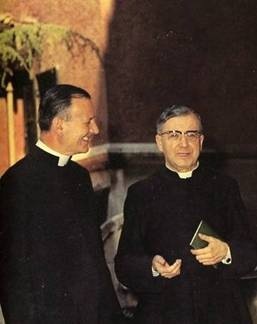 Father Joe was the first to start an Opus Dei presence in the U.S. back in 1949. After many years of service to the Church in the States and in many other countries, he died here in Boston in 1983. We pray that his cause will advance and that the example of his life, devoted to the Church and the salvation of souls, will inspire others to follow on his path. Last Saturday, I attended the Funeral Mass for Bertha McDonough, the mother of our chancellor, Jim McDonough. The Mass was at her parish of St. Bridget’s in Abington. 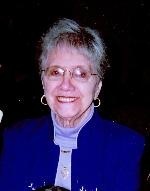 Her seven children and many grandchildren and great-grandchildren were part of the celebration. Many priests and bishops attended the Mass. The chancellor gave a very beautiful eulogy which helped us all to understand Bertha McDonough’s great faith and the beautiful family she raised. 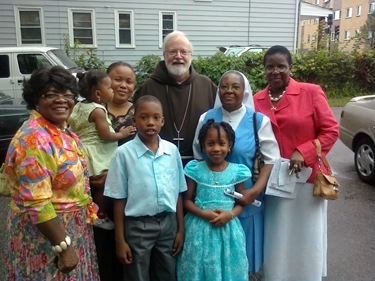 On Sunday, at the invitation of Father Bill Joy, pastor of St. Angela Merici Parish in Mattapan, I visited the weekly Haitian Mass at the parish. There was a very large congregation gathered for the Mass and they showed great enthusiasm for the faith. It was good to have the opportunity to join them in prayer and song. We got to share with the community how important they are to the spiritual life of our archdiocese, and to affirm our great appreciation of Father Joy’s ministry and Lorna DesRoses’ work through the Office of Cultural Diversity. 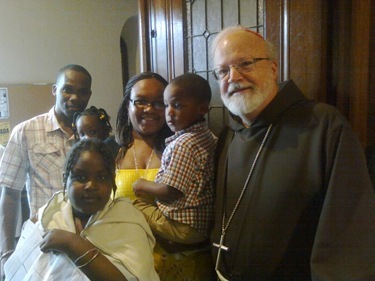 With Sr. Rouby Balmir of the Sisters of St. Francis of Assisi from Port au Prince and mothers and their children from Haiti who have are living with local families, having come here following the earthquake. On Monday, Bishop Francis Antonisamy of the Diocese of Kumbakonam in South India visited me at the Pastoral Center. 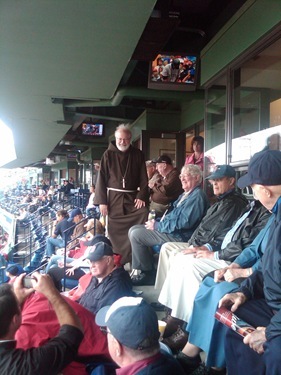 This was Bishop Francis’ second trip to Boston. Two years ago he visited me at the cathedral. On this occasion, he was participating in parish-based mission appeals. He was gathering information, as well, about graduate education in the Boston area with the thought of sending some of his priests here for advanced training. I thank all of you who have supported the missions through your prayers and contributions. These mission appeals are so greatly important because they give direct support to many missionaries and they help to raise awareness of the missions among our people. Bishop Francis’ diocese is blessed with many seminarians and priests. Though Catholics are a minority of the local population in South India, they are fervent in their practice of the faith. I shared with the bishop that we would welcome his priests to assist us in the archdiocese during the time they might be studying here. 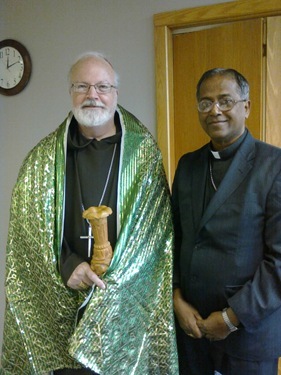 The bishop presented me with a traditional Indian greeting shawl and a hand carved wooden vase. In his region, they put a shawl around your neck instead of flowers. 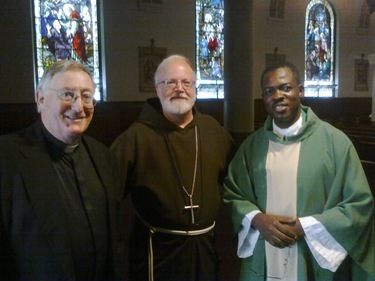 The next day I was visited by Father Pat Byrne, provincial of the Irish and British province of the Divine Word Missionaries. 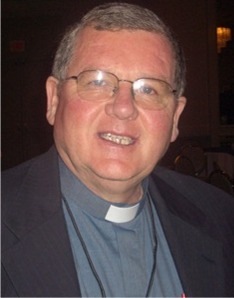 Father Byrne was 10 years in the Vatican working as the head of the Holy Childhood Association. He came to visit our Propagation of the Faith Office and stopped in to see me. He was with me in Lima two years ago. He gave a workshop to our men from the St. James Society when we had the big celebration of the Society’s 50th anniversary. 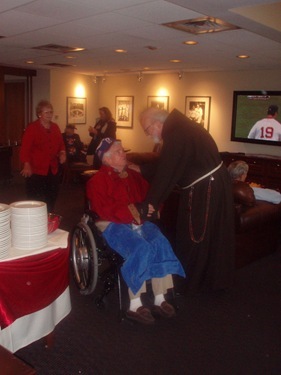 Wednesday afternoon, I attended a Red Sox game with many retired priests including several from Regina Cleri. 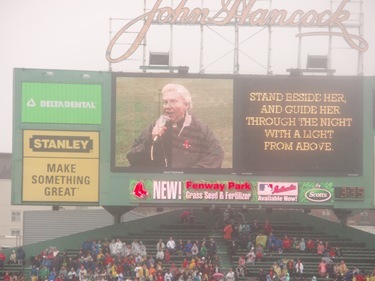 Father Ned Carroll sang “God Bless America” during the seventh-inning stretch. 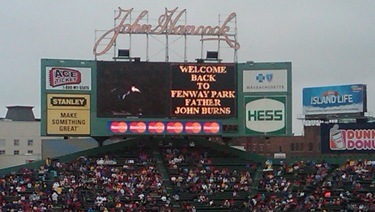 Father John Burns was welcomed to the ballpark as an honorary usher and recognized in the fifth inning on the Jumbotron. 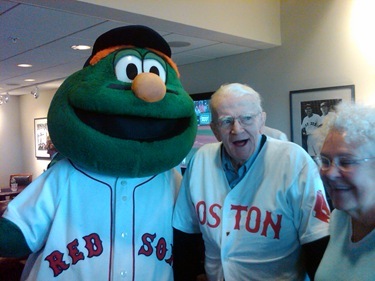 He was an usher at Fenway in the 1940’s. 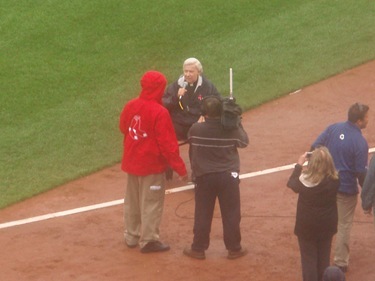 It was nice of the Red Sox to honor him in that way. 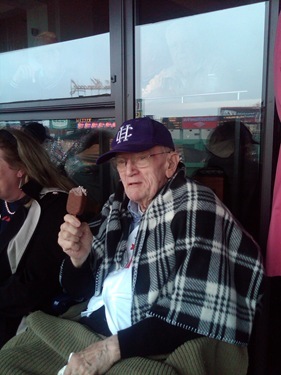 We are very grateful to John Kaneb for making it possible for us to be in a luxury box and to enjoy the good pizza and Fenway Franks, and have a spectacular view of the proceedings. We are pleased that so many men from Regina Cleri were able to come, even those that were in wheelchairs. Thanks to the new bus Regina Cleri has, it was easy to transport them there. 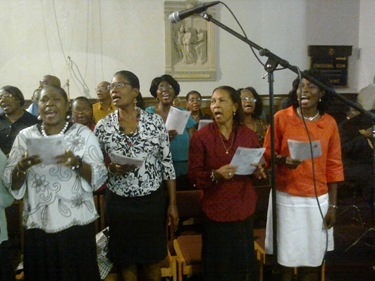 Andreas Widmer, our good friend, recently traveled to Accra in Ghana, Africa to address the Symposium of Episcopal Conferences of Africa and Madagascar (SECAM). 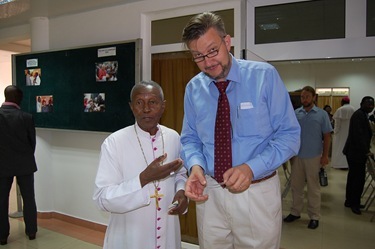 Cardinal Francis Arinze, retired Prefect of Divine Worship and the Discipline of the Sacraments, attended the meeting and introduced Andreas. Andreas shared a presentation on the SEVEN Fund (Social Equity Venture Fund – www.sevenfund.org), a virtual non-profit entity run by entrepreneurs whose strategy is to implement enterprise-based solutions to poverty. The SEVEN Fund does this by targeted investment that fosters leadership through books, films and websites in developing nations and promoting discourse around private-sector innovation, prosperity and progressive human values. We are grateful to Andreas for the significant time and effort he and his business associates give to this work to develop sustainable solutions to the needs of countries and peoples who struggle with the burden of poverty.